For lunch, I made another quick salad with produce box lettuce and mushrooms and oranges from the Farmer’s Market and some pieces of leftover steak. I made a basic vinaigrette with olive oil, sugar, white wine vinegar, salt, pepper, and a dash of dried oregano. Then I made grilled cheese sandwiches with bread from a local bakery… although I did use Kraft processed American cheese singles. I must admit a fond weakness for processed cheese singles! Slice real cheese OR unwrap a cheese single. Heat small skillet on medium heat until a little warm. Put one slice of bread, buttered side down, on the skillet. Immediately put cheese on the unbuttered side and top with the other slice of bread, buttered side up. Gently cook until the bottom side is toasty brown, then flip with a spatula. Finish cooking the other side. Slice on diagonal for cute triangular pieces. If making more sandwiches, turn the heat down just slightly so that the others don’t overcook. I felt like cooking myself a “real” lunch (instead of my usual fare of leftovers or whatever’s-in-the-fridge), so I decided to bake a Farmer’s Market potato and steam some produce box broccoli. Having been forewarned about the strong possibility of aphid-infested broccoli, I gave the whole heads of broccoli a good rinsing. But then I realized that the now-dead aphids (dead from being in the fridge for several days, probably) were stuck inside the tiny crevices of the broccoli. Some people might not care about eating an aphid here or there, but once I saw them, I had to do something about them! I ended up spending about 15 or 20 minutes cutting off each floret and painstakingly washing off dead aphids, using a small paring knife to scrape out the little crevices. A bit ridiculous, perhaps, but I think I ended up with the cleanest broccoli I’ve ever had in my life! And washing the broccoli did give some time for my potato to bake. I used the quick-bake method: Poke a few holes in the potato and microwave for 6-8 minutes until slightly softened, then finish off in the toaster oven for another 15-20 minutes at 450 degrees. I only ate half the potato, sprinkling it generously with shredded pepper jack cheese, piling broccoli on top, and adding a heaping spoonful of sour cream. 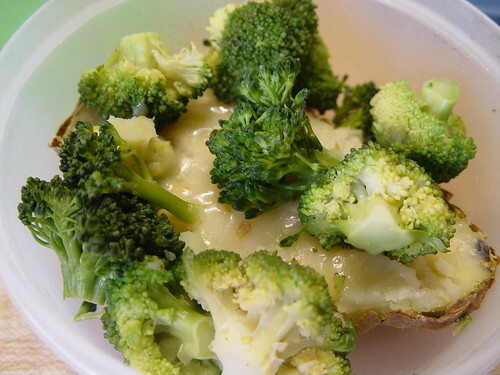 I packed the rest of the potato with some broccoli and cheese for Steve’s lunch the next day. 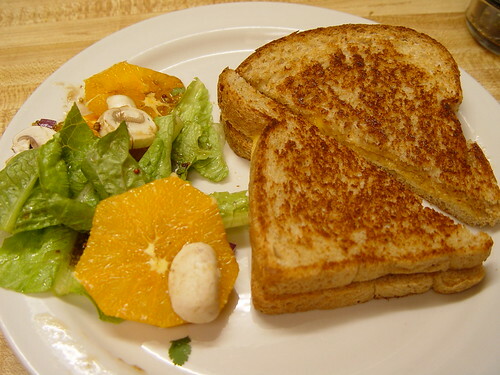 We had a light dinner; I made a repeat salad with grilled cheese sandwich, but adding mustard to the vinaigrette. One of the recipes that came with the Eatwell Farm newsletter was for pasta with arugula. I’ve never cooked with arugula before and didn’t know what to do with it besides including it in salads, so I decided to try out the recipe. Based on previous experience with longer veggie washing times, I washed the arugula in the morning and stored it in a salad spinner. I did end up rinsing the arugula leaf by leaf in a big bowl of water, but it went a lot faster than washing spinach or broccoli. The recipe instructs you to cook pasta, then make a simple sauce of sauteed garlic in olive oil with some salt, pepper, lemon juice, and white wine. (The white wine turned my garlic green!) Tossing the hot sauce, hot pasta, and raw, chopped arugula helps the arugula to wilt down slightly. Very light meal and pretty tasty; I ended up adding some shredded parmesan cheese for some extra flavor. 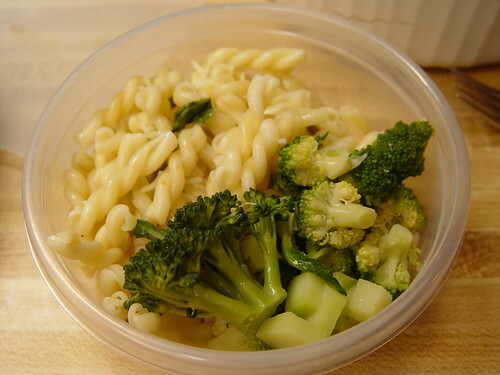 The picture above shows the leftovers, packed with steamed broccoli for Steve’s lunch. For dinner, I made asian barbecued beef short ribs (a new recipe I found online). I’ve never made short ribs before; since I was working with one pound of ribs instead of the six pounds that the recipe calls for, I only baked them for 45 minutes, afraid of overcooking them. I probably should have baked them for longer as the meat was still pretty chewy. 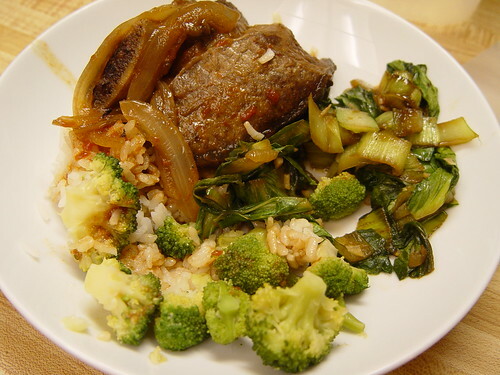 The sauce was delicious spooned over the rice and steamed broccoli, though! I cooked the baby bok choy with my standard soy-garlic recipe. I also made some homemade chicken broth and made a small side of egg drop soup with one of the larger free-range eggs from my box but forgot to take a picture of it. Chop the lighter stems into half-inch pieces, then chop the green leaves coarsely. Heat olive oil over high heat until quite hot and then brown the stems. Add some minced garlic and cook for 30 seconds to toast. Add the leaves and a soy sauce/sugar mixture (about 2 tablespoons of soy sauce and 1 tablespoon of sugar). Toss until the leaves are wilted and serve. Smash a clove of garlic and a small piece of ginger and combine with two cups of homemade chicken broth or stock. Simmer for several minutes on low-ish heat, then remove the ginger and garlic. Pick out your largest free-range egg and beat in a small bowl. Use a utensil to slowly stir the soup in a circular motion and slowly pour the egg in a thin stream into the moving liquid. Mix together a small amount (1/2 to 1 teaspoon) of cornstarch and an equal amount of water and add to the soup to thicken. Add chopped scallions and chopped cilantro. Serve immediately. What’s left from our box? This is a short week for me — going on a short vacation starting this afternoon until Saturday, but I have plans for all the veggies (except possibly two of the leeks) in yummy-sounding dishes before our next box gets picked up on Wednesday! Hi Corrie! I’m so enjoying the play-by-play of your box adventures! I love that you’re documenting everything – I especially enjoyed the omelette step-by-step. What lighting do you use to take your pictures? Is it natural daylight or a particular light source? My kitchen is windowless, and all my on-the-stovetop photos come out so crummy with either the overhead light or my camera’s flash, so I generally don’t get to take “action” photos of my cooking process. I am drooling over the light in your pictures and I would love to know more about what kind it is! Hi scrumptious – thanks for commenting! I have an older Sony DSC-F717. When you have it on the “P” setting, you can choose from some of the preset lighting — incandescent, flourescent, daylight, etc. Most of these particular pictures are on our kitchen counter which has an under-cabinet flourescent light, so I put my camera on the flourescent setting and generally don’t have to tweak or Photoshop it at all! The incandescent setting works nicely with the incandescent bulb on our stove for stove-top pictures. I turn off the flash for all of these pictures so that it doesn’t interfere. No wonder you said you were hungry rereading your post today. Hmm.. that reminds me, I should eat lunch! That’s how I like to make grilled cheese sandwiches too!